Anyway, things have been going well. Astonishingly well. I feel good. I feel better. I can do more now than before the surgery. That’s all good. Then this past week I hit what I thought might be a speed bump. Around last Monday I started having some chest… not pain, per se, but… discomfort. It wasn’t bad, but I was a little concerned. As the week went on it remained, but it lessened. Ok, I thought, it’ll go away. I spoke to some people at rehab about it on Monday, and we agreed it might be natural long-term side-effect of recovery, but to still keep it in mind to have it looked in to if I thought it necessary. Fast forward to Thursday, and I’m home from work for another reason, but I’m really not feeling well, either. The discomfort in my chest has suddenly increased, and is very uncomfortable. It was in the center of my chest and my upper chest in front of my shoulders. I describe the pressure as standing against a wall, trying to take in a deep breath, and feeling pressure on my chest because the wall will not give way. I also felt pain/pressure when I would move suddenly and/or turn abruptly to either side. But at the same time I don’t *know* what it is. I’m also constantly told, “If you feel anything bad have it checked immediately.”, so I did. Later in the afternoon, Missy and I headed down to the ER again. I am again whisked into a room in the back… I later learn they have 36! rooms in the ER and that it’s not common, but not unusual, for them all to be occupied at the same time… and am asked a slew of question, the usual poking and prodding, and so on. But because this is heart related they do an EKG, which came out fine. The doctor was afraid of a possible blood clot, which is not unheard of for people after heart surgery, so they do an X-ray and a CT Scan. Those both came back negative. It is decided to have me stay overnight for observation… which I had kind of predicted would happen before I even went in… to do some more tests in the morning and to consult with the day’s cardiologist. I felt gypped because, during my surgery, I had a very small broom closet-like room that was very sterile and cramped. This time I had a very nice and spacious room that was actually comfortable. But I digress, again. The next day I have another EKG, an Echocardogram, and a treadmill stress test. The EKG (which might have been the night before, I forget), was even better than the first time. The Echo was fine. The stress test was fine. Interspersed between these tests is consultations with the Hospitalist (on-call doctor of the hospital), an on-call cardiologist and his nurse practitioner, pretty much everything heart-related is ruled out. As coincidence would have it, I already had an Echocardiogram scheduled for the next Monday, which I now no longer needed. In talking with the on-call cardiologist, he wants to keep me for a second night of observation “juuuuust to be safe”… where have I heard that before?… and because my regular cardiologist was on-call the next day, but Missy and I quashed that pretty quickly, and he backed off, though I sensed grudgingly. It was after this that the treadmill stress test was done. The cardio nurse practitioner was present during my treadmill stress test, and afterward she saw that I was not suffering any heart ill-effects. Bottom line, through an incredible series of process of elimination, it was determined that it was most likely just inflation in my chest cavity and/or around my lungs. I have some anti-infamatory medication for the next 30 days and instructions to take ibuprofen as needed. I’ve been out for two days and I feel much better. In my non-medically trained opinion, the inflammation makes the most sense. So here I am, telling another story, and I hope it helps someone down the line. We shall see. As a last point, I want to reiterate again what amazing and stellar care I was given by everyone at my local hospital, especially the nurses. I said it before and I’ll say it again, the nurses make or break the entire experience. 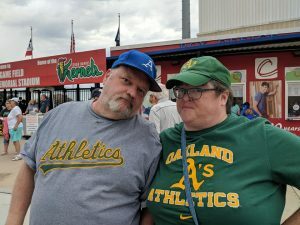 Ken & Missy enjoying a baseball game, August 2018. We keep your data private and will not sell or share it with anyone... unless the police make us do it per law... which is pretty unlikely. Sherry Ackley on Setback? Nah. Iowa Landscape Photography – Ken’s photography website, blog, and business. Iowa-Photo-Classic – the ‘classic’ (read: old) version of the website. I keep this around just for fun. I’m self-taught in html and cobbled it together myself. Michigan Landscape Photography – A Michigan version similar to Iowa. 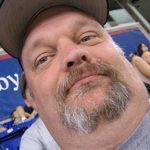 The Grump – A curmudgeonly and (usually) tongue-in-cheek commentary site to showcase my sparkling personality and sarcastic humor.